I was hoping that there would be a crock pot in the kitchen at the cabin. I really wanted to cook with one while we were here but not bad enough to lug one of mine from Tampa. I just didn't have a desire to pack "everything but the kitchen sink" and planned to improvise. Imagine my delight when I got here and saw that there was a little crock pot -- big enough to make food for just about 2 people...which is all I need because that's all I'm cooking for this week. Crock pot meals are some of my favorite and always have been since we've been married. I love it because you can make the food the night before or early that morning, turn it on and then forget about it until you're ready to eat. When we're home in Tampa going about our regular schedule it's nice to walk in the door from work, or from church on Sunday and have our meal already waiting for us. 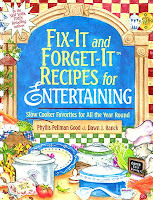 If you are really wanting to get into crock pot cooking you really need the book, Fix it and Forget It by Phyllis Pellman Good. 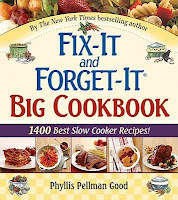 This is the bible of crock pot cooking. There are several individual books or you can get the Big Cookbook , pictured above that contains everything. I don't have the Big Cookbook yet, I just have the one that is "Recipes for Entertaining", pictured at right, and just that one is full of every kind of crock pot recipe you can imagine from appetizers to main dishes, and even beverages and desserts! I could cook from that book every day for a year and never make the same thing twice. Once I saw the little crock pot here I decided to make a crock pot version of chicken and dressing (stuffing) for yesterday's dinner as Larry is absolutely crazy about chicken or turkey with dressing. I had to improvise and scale the recipe down to go in the little crock pot, but this is what I did for yesterday's meal, cutting the recipe in half since it's just the two of us, and even then it was much more than we needed, so we have leftovers. I believe this little crock pot pictured here was 2 quarts and that's what the recipe looks like when finished. I took the photo right before I served it. Boil chicken breasts in salted water until cooked through. Place in crock pot. Take rest of ingredients and mix together to desired consistency. (Some people like dressing/stuffing more wet, some like it drier or firmer.) Layer chicken with dressing in the crock pot and cook on low for 8 hours or high for 4 hours. Fix it, forget it, when you're ready, enjoy it! By the way, I'm fixing breakfast and lunch today (another crock pot recipe) but tonight we're going out! Yay! We're headed to our favorite place to eat here in Gatlinburg , The Applewood Farmhouse, and to see Joseph and the Amazing Technicolor Dreamcoat. It's at the Miracle Theater in Pigeon Forge, and although we were ready to pay full price for tickets, we discovered they do tickets for pastors at half price. What a blessing! Joseph and David are my two favorite people in the Old Testament. I'm gonna love this! "Joseph...." is one of my favorite musicals of all time - you ARE gonna love it!!! I love that cookbook series! With our busy lives, our crockpot is used often!